Orthomega Select® EPA is a powerful omega-3 concentrate that supports cardiovascular health and balanced blood sugar levels. It also provides high-intensity support for joint discomfort and muscular-skeletal integrity. Omega-3 fatty acids are known to benefit cardiovascular health, support a healthy cognition and mood, and to help maintain a healthy inflammatory response. Achieving the proper balance of omega-3 fatty acids has become an important health strategy, requiring supplementation for most people. While EPA/DHA combination formulas remain the backbone of any fish oil regimen, as research on fish oil continues, new evidence has emerged supporting the value of unique formulations of EPA and DHA for targeted uses. Extensive research has shown that EPA from fish oil enhances cardiovascular health and promotes better brain function. With over 10,000 published studies in the last three decades, EPA from fish oil is among the most researched natural ingredients available and has a long history of safety and efficacy. 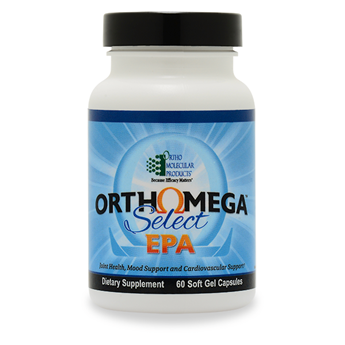 Orthomega® Select EPA is a high-concentration fish oil designed for those needing intensive nutritional support of this essential fat. Research shows that EPA promotes a positive mental outlook and has a significant calming effect on the brain. In addition, EPA has been shown to improve joint mobility and support cardiovascular health. Orthomega® Select EPA is sourced from off the Chilean coast, where cold, fresh waters provide the cleanest, most sustainable source of fish in the world. Each capsule provides 660 mg of EPA per soft gel as natural triglycerides, for superior absorption. This high-concentration EPA fish oil is enzymatically purified, vacuum distilled, and independently tested to ensure heavy metals, pesticides and polychlorinated biphenyls (PCBs) are removed to undetectable levels.